The Glastonbury 2016 line-up won't be released in full until the new year, but that hasn't stopped tickets selling out in record time or the rumour mill spinning out of control. The latest comes courtesy of Muse being named as the latest bookies' favourites to headline. Could the Drones tour make a stop at Worthy Farm? The 'Pyscho' space-rockers have headlined the festival twice before - but have teased that they are 'hoping' to perform at Glasto next year. Now, Betfair have slashed odds of Muse topping the bill. 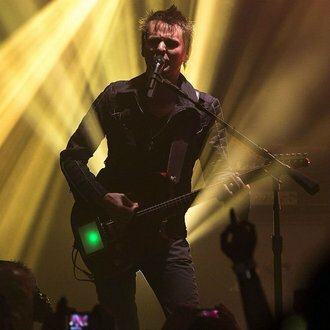 “It’s likely that by this point the headline acts will have been agreed and finalised, so after a flurry of bets from the Sheffield area on Muse, they have gone from 12/1 to 2/1 to take the Pyramid stage on the Saturday," said Betfair's Colm Rock. “Adele has been the odds-on favourite in this market, with a global number one and a new album out but has drifted to 11/4 second favourites. Stone Roses were also a popular bet ahead of their new tour announcement two weeks ago and remain 7/2 third favourites." The awesomely-named Mr Rock is wrong about one thing though - as Michael Eavis revealed that headliners for Glastonbury have already been booked for the next two years. Meanwhile, Adele is also a favourite to headline, alongside Foo Fighters and Coldplay - while Rod Stewart and Leo Sayer have also voiced their ambitions to appear. If Muse don't play, make sure you catch them on their massive Drones tour - which is set to be 'their most ambitious yet'. Check out their plans for the show here. Muse's full upcoming UK and EU tour dates are below. Tickets are on sale now. For tickets and information, visit here.